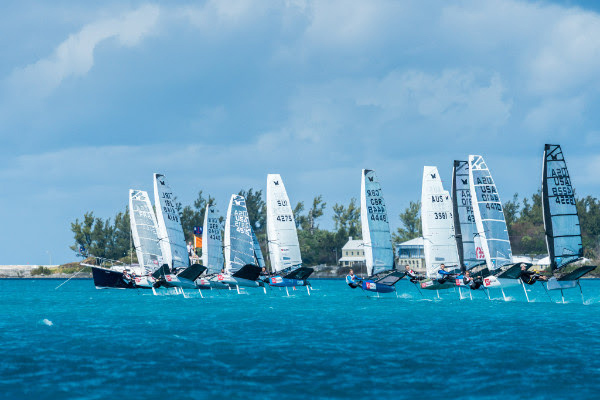 Joshua Greenslade has won the Bacardi Moth Bermuda National Championship. Racing was cancelled today because the wind on Great Sound was blowing a steady 25 knots with gusts approaching 40 knots. With the Bacardi Moth World Championship scheduled to begin Monday, Principal Race Officer David Campbell-Smith felt it was an easy decision. “There really was no reason to send anyone out today. It’s just too windy,” said Campbell-James. Even if racing had been held, Greenslade wasn’t sure he would’ve been able to race. He had troubles yesterday with the bow-mounted wand that helps control the hydrofoiling characteristic that is the hallmark of the Moth class. CONGRATS to Joshua for being 1st amongst the Bermudian Sailors. & CONGRATS to Paul for being the Overall Winner. Looking forward to reading about more races here.